KIEV, Ukraine -- Rebels and government troops fired on each other’s positions Sunday in a strategically important city in eastern Ukraine, sending residents into bomb shelters, as Washington released images that it said proved Russia is shooting across the border into Ukraine to support separatists. The US State Department released this and several other images it says show Russian forces launching rockets from Ukraine and Russia at Ukrainian forces this past week. At least 13 civilians were reported killed in the fighting around Horlivka, an industrial city of almost 300,000 people about 30 miles from the rebel bastion of Donetsk. According to a resident reached by telephone, parts of the city are without water or electricity, grocery stores are empty, and rebels and residents are fleeing. The Ukrainian military denied targeting civilians and said the pro-Russian rebels were to blame for the damage and casualties. The military accused the rebels of firing into residential neighborhoods. The battle in Horlivka is part of a major push by the military to isolate and eventually oust the rebel fighters from the self-proclaimed Donetsk People’s Republic. It would be a huge symbolic and strategic victory. As the fighting raged, Secretary of State John F. Kerry and Russian Foreign Minister Sergei Lavrov talked briefly on the phone. According to a Russian Foreign Ministry statement, they discussed the need for an “immediate” cease-fire in Ukraine. As the ground war in eastern Ukraine between Russian-backed separatist forces and government troops has escalated, the war of words and images between Russia and the West has reached a fever pitch. 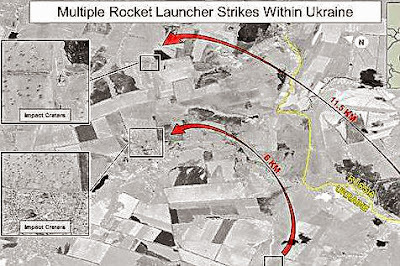 The Obama administration on Sunday released grainy surveillance photographs that it said were evidence that Russia has fired artillery rounds from its side of the border on Ukrainian military units. Maj. Gen. Igor Konashenkov, a Russian Defense Ministry spokesman, charged Sunday that the United States is getting most of its intelligence data on the Russian military from social media and suggested that it turn to more “trustworthy” information, the news agency Itar-Tass reported. Konashenkov denied U.S. statements last week that Russia, after first decreasing the number of its troops deployed along the Ukraine border, has increased their ranks to at least 15,000. Under the international treaty, member governments regularly conduct overflights, after providing advance notice, of neighboring countries. Although such flights were common in the early days of the Ukraine conflict, it is unclear whether any have been conducted recently. The State Department and the Office of the Director of National Intelligence, both of which distributed the photographs to journalists Sunday, did not indicate the source of the photos, which were labelled with the imprint of DigitalGlobe, a commercial satellite and aerial-imaging company. 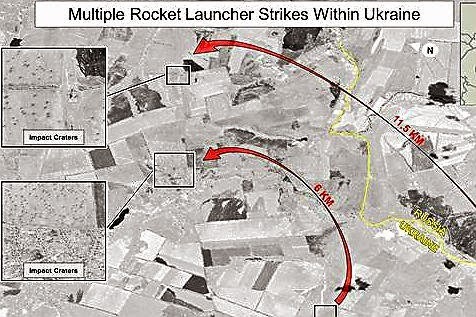 The high-altitude images released Sunday “provide evidence that Russian forces have fired across the border at Ukrainian military forces, and that Russia-backed separatists have used heavy artillery, provided by Russia, in attacks on Ukrainian forces from inside Ukraine,” according to labels on the pictures provided by the U.S. government. The most recent photograph, taken Saturday, shows what is described as “blast marks” from rocket-launcher fire on the Russian side of the border and “impact craters” inside Ukraine. On the other side of the border, “the pattern of crater impacts near the Ukrainian military unit indicates strikes from artillery fired from self-propelled or towed artillery, vice multiple rocket launchers,” the label says. The Obama administration has said that direct Russian participation in Ukraine, along with Moscow’s failure to use its influence on the separatists to allow international inspectors access to the site of the July 17 Malaysian airliner crash inside separatist territory, should lead to increased sanctions against Russia. A team of forensic experts and investigators that arrived Sunday in Donetsk had planned to head to the crash site, but the visit was called off for safety reasons. Sunday marked the third day of the Ukrainian army’s assault on rebels in Horlivka. Some residents said shelling began shortly after dawn Sunday and continued intermittently throughout the day. Andriy Lysenko, a Ukrainian military spokesman, said troops are not carrying out air or artillery strikes against civilians. He blamed the attacks on rebels, who he said are trying to frighten residents and discredit the army by posing as government troops. A video taken Sunday in Horlivka showed large plumes of gray smoke rising from several places in the city. A resident named Viktor, a 32-year-old engineer who asked that his last name not be published because of the precarious situation, said he watched from his sixth-floor balcony as army troops and rebels exchanged fire. He said he saw rockets launched from a rebel position answered by return fire a few minutes later. The weapons fire ignited the local energy company’s office, struck a supermarket on the ground floor of an apartment building and destroyed a building housing the kitchen of the local hospital, he said. Viktor described an eerie emptiness in Horlivka. Traffic, he said, is mostly just a few speeding cars that appear to be driven by rebels. Residents who live in houses are spending nights in their basements, he said, while apartment dwellers have retreated to abandoned, Soviet-era bomb shelters that smell of sewage. “A lot of people have left,” Viktor said. Quote: "Напомним, Кабинет Министров повторно вносит в Верховную Раду проекты законов об изменениях в госбюджет на 2014 год, в Налоговой кодекс Украины, а также об эксплуатации и модернизации газотранспортной системы Украины."